It’s not quite as extreme as dropping the YouTube(s GOOG) app and building its own Maps app for iOS 6, but Apple(s AAPL) has also made a rather radical change in the way it manages a user’s podcasts on iOS devices. Like the Maps app and YouTube app, this has caused some iOS 6 upgraders to look to third-party apps in the App Store to bring back the functionality they had before the change introduced in September. There are two basic parts to each podcast, the feed and the episode. The feed is a just a list of all of the episodes that the producer of the podcast has published on the web. 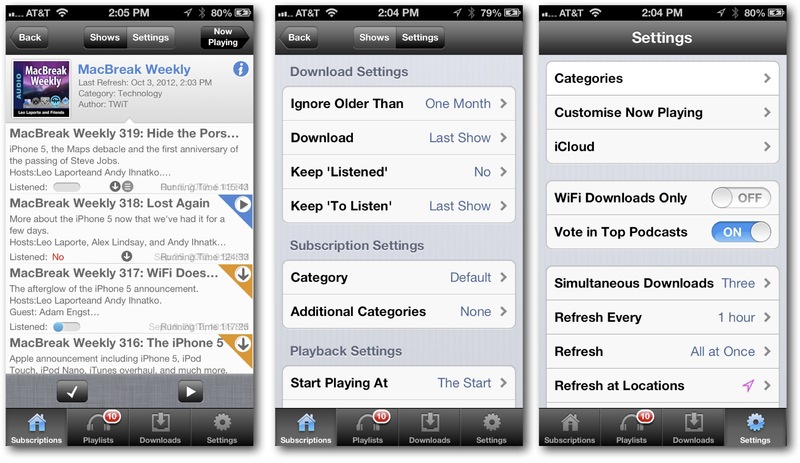 Podcasting apps manage both the subscribed list of feeds and the individual episodes. Schedule – Much like an alarm clock, at scheduled time intervals, a local notification will “wake up” the podcasting app and tell it to check its subscriptions for updates. Push – By hosting their own remote notification servers, developers can automatically send push notifications to each iOS device, and “wake up” the podcasting app to allow it to update the feed information for that podcast. Location – More recently, a few developers have added the ability to “wake up” the podcast app when you arrive or leave a particular location. Once awake, the podcasting app only has a short period of time to try and check if each podcast’s feed has been updated. This was not a huge problem in the past. Apple used to require users to tether their devices to their Macs in order to sync the latest podcast episodes. 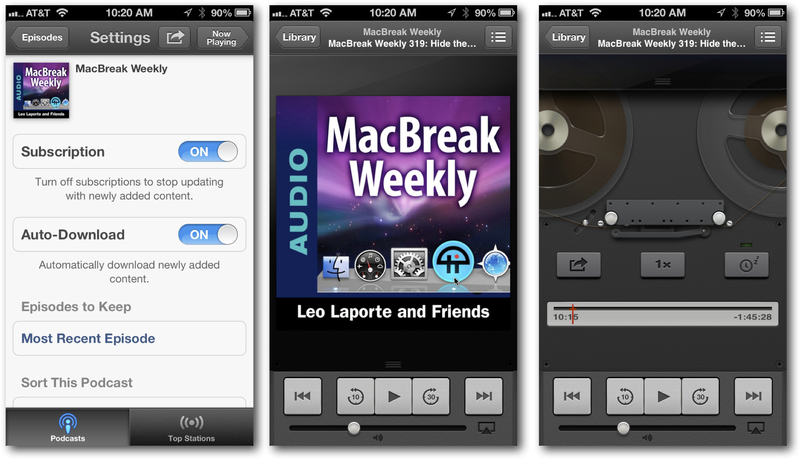 With iOS 6, Apple’s new Podcasts (free Universal) app caters to users that no longer tether to their Mac. Users can now check for feed updates regularly, and automatically download new episodes as soon as they become available. The one big omission is the ability to organize and create playlists for your podcasts. If this feature is still important to you, you may want to consider one of the third-party alternatives. There are three apps that have been considered the best podcasting apps for a while: iCatcher ($1.99 Universal), Downcast ($1.99 Universal), and Instacast ($1.99 iPhone, $4.99 iPad). Each of these apps offers really good support for keeping your feeds up to date, backing up subscriptions to iCloud, creating custom playlists, and with the exception of Instacast, offering a variety of full-screen gesture-based playback control options. You can however get lost in all of the configuration options that allow you to fine-tune the behavior of each feed individually. While mature and very stable, adding features over time has made them a bit too complex for the casual podcaster to appreciate. On the slightly simpler side of podcasting life, there are three relatively new apps that are worth considering. 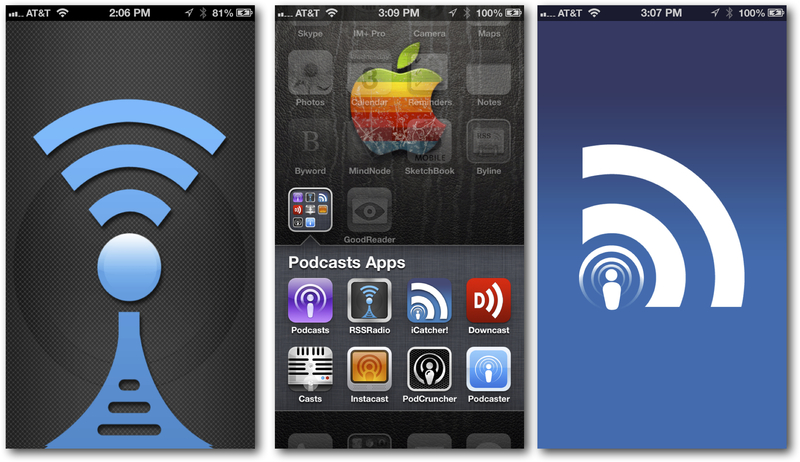 These are RSSRadio ($1.99 Universal), PocketCasts ($1.99 iPhone), and PodCruncher ($1.99 iPhone). Two of these apps are iPhone only, so if you are looking for something that accommodates the iPad, RSSRasdio is your only alternative. RSSRadio is also the only one of the three that offers full-screen gesture-based playback control options and backing up subscriptions to iCloud. Each of these apps does a very good job of managing your feeds, downloading episodes, and cleaning up after themselves by deleting the episodes that you have already listened to. Simple – When you forget how Apple used to manage podcasts, its current Podcast app is actually pretty decent. It gets the job done and has a streamlined user experience that is really pleasant to use and unmatched by any podcasting app out there. This makes Apple’s podcasting app the app of choice for the casual podcaster. Full Featured – When it comes to choosing between Downcasts and iCatcher, I would have to say that the latest round of updates places iCatcher slightly ahead of Downcasts. This again is primarily due to the fact that I happen to value speed above all other features. 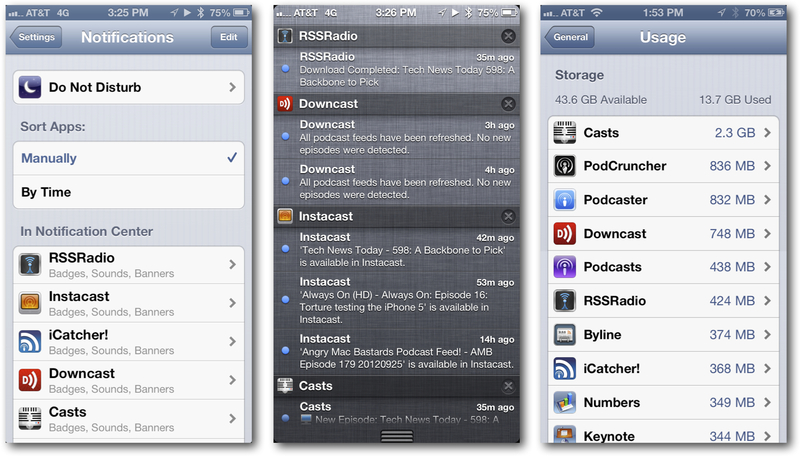 Instacast has fallen woefully behind and no longer compares to either Downcasts or iCatcher. Fast – I have found that RSSRadio is one of the fastest podcasting apps when it comes to managing feeds and downloading episodes. At the moment, no other app has been able to match it when it comes to managing those basic tasks. And when you are in a hurry to get out the door, the advanced features are useless if you don’t have any content to play. One thing is for certain, all six of these apps are being updated regularly by their developers. So if you have been using your current podcasting app for a while now, try out one of the others on this list. You may just be surprised at how good some of the these podcasting apps have become since the iOS 6 release last month. I love how in the beginning of the article, the techniques that podcast apps use on iOS to check for feed updates revolve around ‘push’ strategies. These apps are cool, but they still don’t solve discoverability in a good manner. Also, keeping on top of your subscriptions is always a hassle. In that sense they’re as bad as the Podcasts app. I think the next of revolution of podcasting apps should work in a completely different way. Its all about taking ‘Push’ to the extreme :) … In fact, this already exists (shameless plug): check out The Super Times, http://thesupertimes.com – every week you get an edition packed with awesome content and all you have to do is listen! I am quitting the Apple podcast app because I can no longer read / watch / access anymore to the episodes comments / information section for the podcasts that cared to fill it. I’ve just recently downloaded a new podcast app for the iPhone (http://itunes.apple.com/us/app/the-super-times/id509942440?mt=8), although it’s not a catcher like the ones mentioned here, it does simplify finding interesting feeds etc as it just sends a bunch of interesting episodes to listen to each week. I get quite a lot of variety this way. I also agree that InstaCast is easy to enough to use although I often end up over subscribing to feeds and then playing catch-up. Also I’m not enjoying Apple’s new podcasting App at all. I still feel that there could be better apps out there to cater to my podcast and radio listening needs. I have reviewed them before and still think InstaCast, while the most expensive, is the best. These are not “podcasting apps” any more than a television is a “broadcasting device”. Podcatchers, podcast players, podcast clients are all common terms. I would be VERY interested in an article about actual podcasting apps. The one big omission in Apple’s Podcasts app is episodes that actually do download or play.